Finding lightweight projects to work on during the summer can be tricky. You want to crochet but it’s too hot to be holding a thick blanket next to your skin for hours. I usually make toys and small things in the summertime, but I really had the urge to make a blanket. 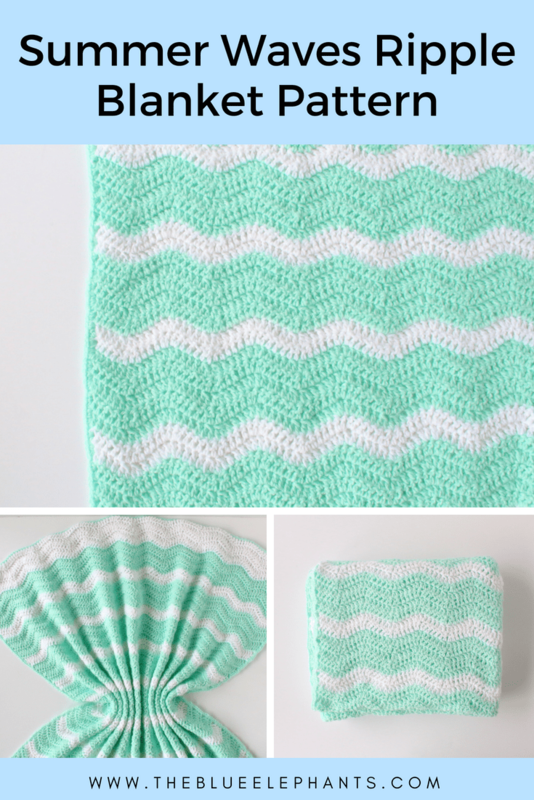 So I came up with a lightweight ripple crochet pattern that is perfect for summer. The colors of this blanket are so pretty. 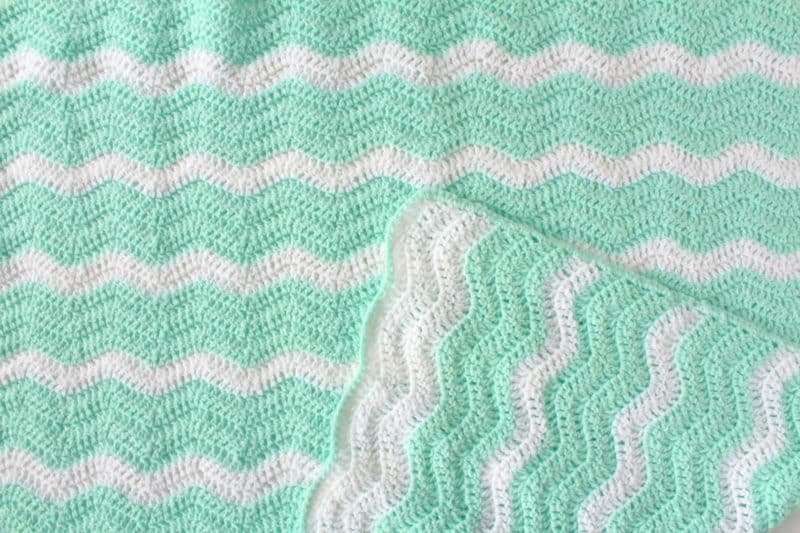 The seafoam green and the white go together so well and make the blanket feel even lighter and airier. 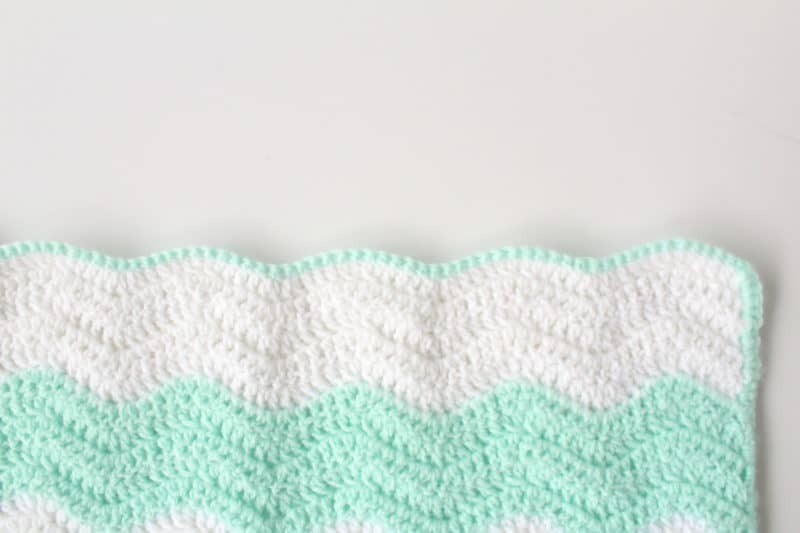 Along with the ripple crochet pattern, this beautiful pale green reminds me of the sea and waves rushing over soft sand. 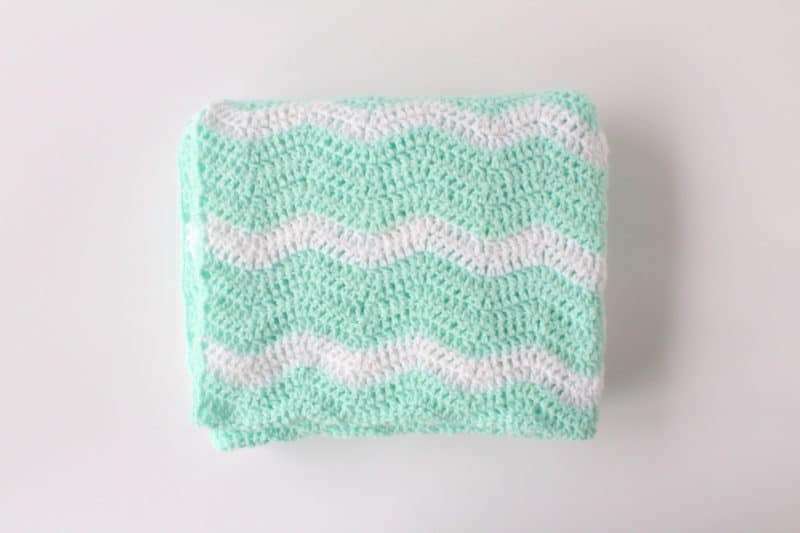 I can imagine this being a blanket you wrap your little one in when it’s windy but so nice out you just need a beach day! 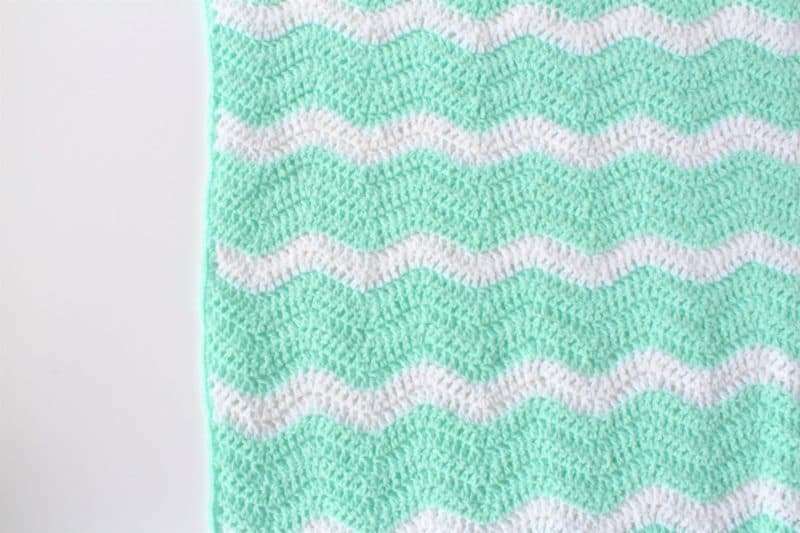 The pattern itself is really simple to recreate and there’s just a thin border around the edge to finish it off and keep it wavy. To make this blanket, I only used 2 skeins of yarn! I used Lion Brand Pound of Love in the colors Pastel Green and White. This yarn is incredibly soft and really easy to care for, which makes it perfect for anything “baby”. It’s a light worsted weight yarn so it’s even great for shawls and thinners sweaters or cardigans. I usually have a skein of white on hand so I just grabbed the green to get this pretty color combination! You can see the other gorgeous colors of this over on the Lion Brand website. With the white, chain 159 or a multiple of 12 + 3. Row 1: Work into the back bumps of the chain for this row. DC into the 4th space from the hook (count ch 3 as DC). *DC into each of the next 3 spaces, [DC2tog over the next 2 spaces] twice, DC into each of the next 3, [2 DC into the next space] twice*. Repeat everything between the *s along the chain, ending with 2DC in the last space. Row 2: Chain 3, DC into the same space. *DC into each of the next 3 spaces, [DC2tog over the next 2 spaces] twice, DC into each of the next 3, [2 DC into the next space] twice*. Repeat everything between the *s along the row, ending with 2DC in the turning chain of the last row. Row 3-71: Repeat row 2 until the blanket is the desired length. TO create the ripple crochet pattern for my blanket, I started with 5 rows of white, then 5 rows of green. Then, I alternated between 2 rows of white and 5 rows of green until I had 9 thick green stripes. Then I finished with 5 rows of white. For the border, I attached a new piece of green and worked one row of SC, then SC 3 into the last space and turn to work into the side of the blanket. Work 2 SC into the side of each DC and the work 3 SC into the corner. Turn and continue all the way around the blanket and bind off. Weave in the loose ends and you’re done! I can’t get over how summery this baby blanket feels! 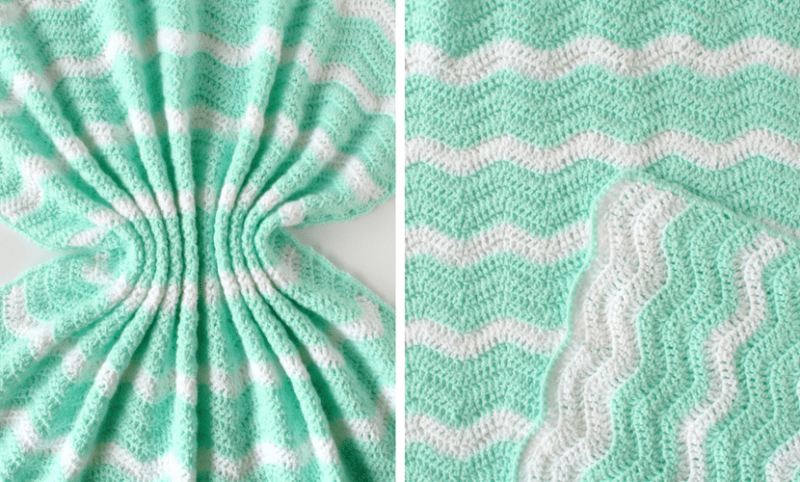 It’s light and airy, and the ripple crochet pattern just makes it that much more beachy. 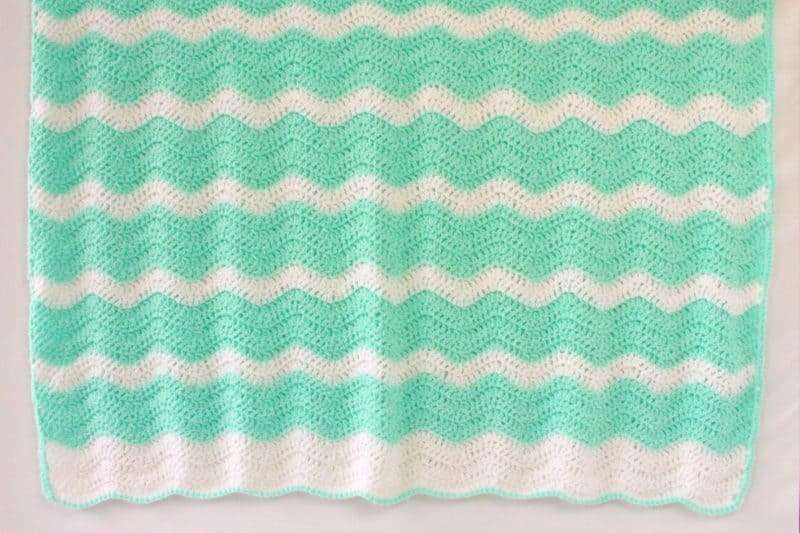 I used a pale green color for my blanket, but there are lots of other colors in this line that would look beautiful too. I think I’ll make one in that peachy coral next. This blanket is a receiving blanket size, so it’s 40×40 inches. I tend to work my blankets to whatever size I like if I’m just playing around, but I do need exact sizes sometimes. I put together a little freebie for you guys if you want to keep track of different blanket types and sizes. Thanks so much for reading! I hope you guys liked this pattern and the new freebie. 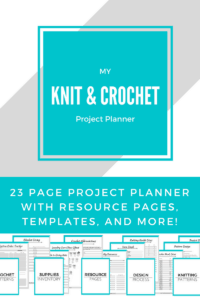 If you haven’t already, check out some of my other crochet blanket patterns and be sure to subscribe down below! 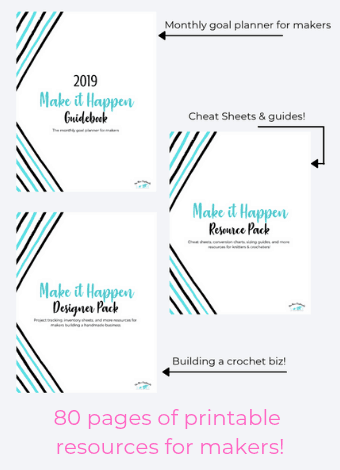 You’ll be signed up for the weekly newsletter and free patterns and updates delivered right to your inbox every week. Does this Afghan have a right and wrong side to it? No, it’s the same on both sides. Same as Liz. At the end of row 1 I have 3 spaces after the last DCtog 2. It says to 2dc in next space twice. I’ve counted my stitch 3 times and frogged 3 times help!! Hmm.. I may need to try this again and see what the problem is. I’m updating all my patterns and pictures anyways! Thanks for the feedback! One more question – I’m 4 rows in, and it seems to be getting wider. At the start of each row, is it chain and then 4 DC (DC in same space as chain and then 3DC), or does the “DC in same space” count as the first of the 3 DC in the repeating pattern? Thanks for the pattern! 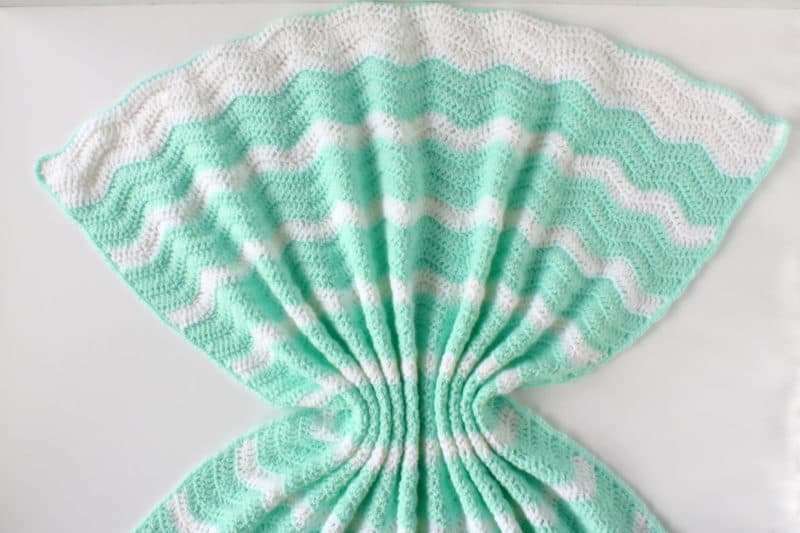 I have a June niece coming, so I’m glad to find something lightweight :^) From the photos it looks a bit ribbed – did you do back-loop only rows? If not, do you think that would work with this pattern? Congrats!! The actual blanket isn’t ribbed, the pictures seem that way because I took the swirling blanket picture first and didn’t smooth it out before taking the rest. My bad! You can absolutely work back loops only for a more textured look though. I’m confused by your directions. I cannot get past the first row – I DC in fourth space and then in the next 3 spaces. But then it gets confusing – “DC2tog over next to spaces TWICE” – what do you mean twice? As in do a DC2tog twice using the same 2 holes or do a DC2tog in 2 holes and then do another DC2tog in the NEXT two holes after that? Same question with the “2 DC in the next space TWICE” – Do I put 2 DC in one stitch and then 2 DC in the stitch after that or am I putting 4 DC into 1 stitch? Maybe I am overthinking, but I am working myself into a square with these instructions as I am not understanding them. Thanks! For the first part, you’re working a DC2tog over the first two stitches, and then the NEXT two stitches. Same with the next part: you work 2 DC into one space, then 2 DC into the NEXT space. Hope that helps! When you make the chain, there’s a V on the front of the chain and you normally insert the hook into that V. On the other side of the chain, there’s a little loop or the back bump, and when you work your stitches into that loop, you get a clean edge. Thank you, Angie! It’s very easy to do! This is so beautiful. Thanks for the pattern.